Hello my friend! That's me, over there. Too bad "political correctness" didn't exist in the 1970's, or else I might've been something cooler, like a super hero or a member of KISS. Even some movie monster would've been better than a "Chinese Guy"! 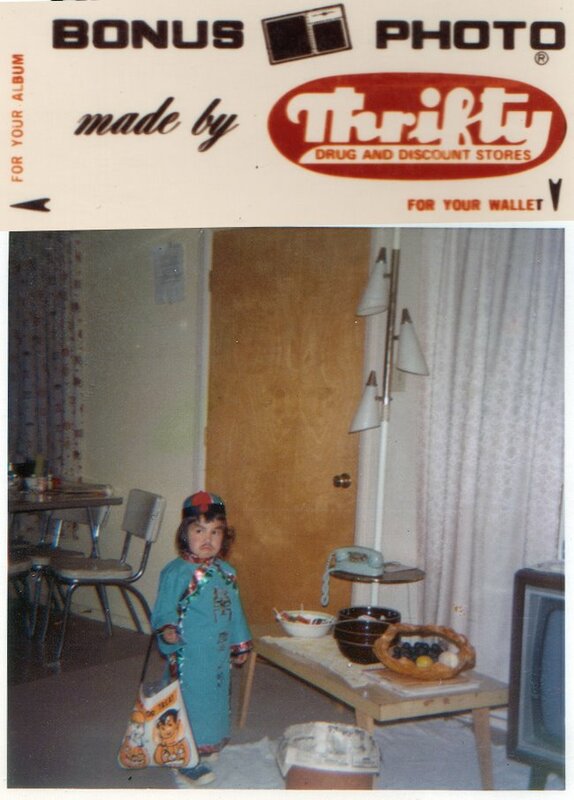 (Mom, I know you were new to Halloween back then, but dressing me up as someone from where you grew up, was kind of weird.) Anyways, welcome to my portfolio. It's basically a showcase of stuff I do. As you can see, I love playing around with different styles and influences, from retro to anime, cartoony to graphic, mostly done in Photoshop. Hope you dig it! I think my lot in life was cast at around five years old, when I started drawing dinosaurs on the walls of my room. It was also about the same year I got electrocuted in said room, while playing with my plugged in nightlight, sans light bulb. Coincidence? After wrapping up my exciting higher education experiences studying Fine Art at Oregon State University (Go Beavs! ), and Classical Animation at Vancouver Film School, I began my career doing advertising and feature animation work at International Cartoons. It was fun while it lasted. I remember some people from the F.B.I. showing up at the studio one afternoon, and a couple weeks later, the place went out of business. However, it ended up being a blessing in disguise, as I eventually landed a job at Film Roman, doing layouts on "King of The Hill". (Why do "blessings in disguise" always dress up as bad things? Just wondering.) Anyways, In 2005 I was promoted to director, where I helmed several classic episodes over the next three years. Upon the show's cancelation after 13 seasons, I spent a while doing other stuff, including a consulting stint on the web comedy "Surveyors of Land", until I landed my current awesome job as Retakes Director on "American Dad!". Now for the really important stuff (or just some random info about me). I collect old school robots, from classic tin toys, to 70's Japanese mecha. My all-time favorite Christmas present: Atari 2600 back in 1982. I spent one summer in Orlando working as an attractions host at Disney World. I once ate balut, and it was a lot tastier than it looked. My all-time favorite cartoon: Battle of The Planets. When I was in the Boy Scouts, I used to roll pine needle and moss cigarettes on camping trips, then smoked them. I love old comic books. During my college days I worked part-time as a sports anchor on the local evening news.